Guillem Belmar comes from Catalonia and studies Multilingualism at the University of Groningen. We had a chat with him and talked about his motivation to come here and his thoughts on multilingualism in Fryslân. Hi Guillem! Who are you? My name is Guillem Belmar Viernes. I come from Girona, a city in North-East Catalonia. I studied Translation and Interpreting in Barcelona (UAB), where I translated to and from Catalan, Spanish, English and Chinese. I also took a minor in Basque studies, and wrote my BA final project on the role of translation in the revitalization of the Basque language. Then I went on to study a Master’s Degree in Linguistic at the Spanish Open University (UNED) while I was teaching English and Chinese in a private institution. I also took part in the Institute of Collaborative Language Research in Fairbanks, Alaska in 2016, a 2-week gathering of linguists and activists working on minority and endangered languages all over the world. I am currently studying the MA in Multilingualism at the University of Groningen and writing my Master’s Thesis on attitudes, motivation and language use of learners of Frisian. 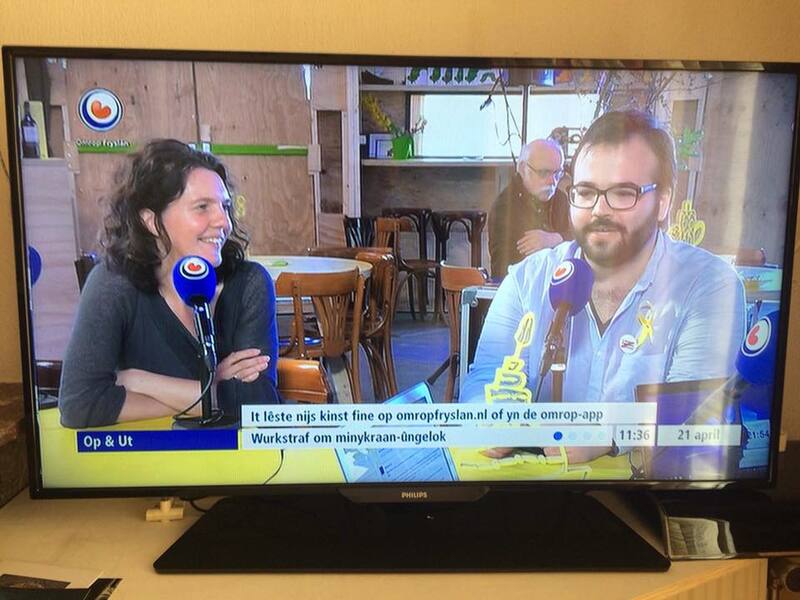 I am also carrying out a small study on the intelligibility of Frisian for Dutch speakers (together with Sara Pinho), with which we are representing the RUG – Campus Fryslân at the Leeuwarder Courant Awards this year. So what motivated you to come all the way here to study Multilingualism at the University of Groningen? 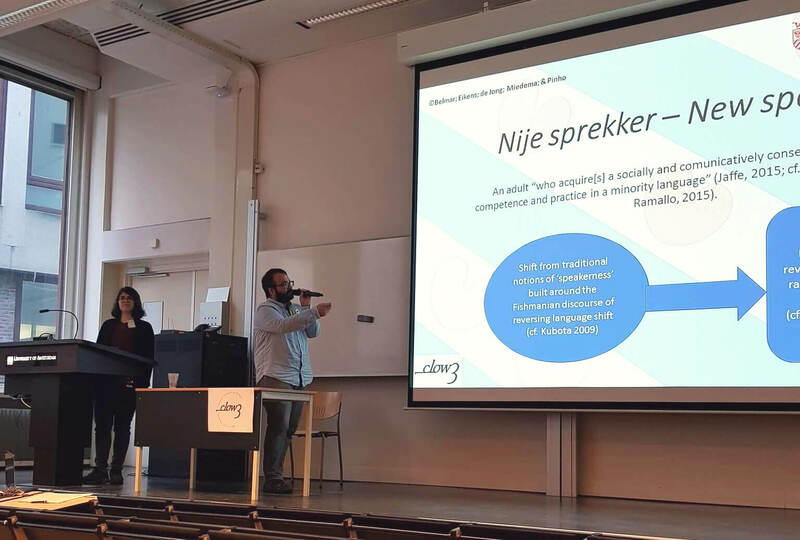 My interest in minority languages led me to question the notions I had of bilingualism and multilingualism, so I decided to enroll in the Master’s of Multilingualism at the University of Groningen. Not only does this Master’s offer a comprehensive overview of the issues surrounding research on multilingualism and with multilingual participants, but it also offers the insights of minority language research through the study of the case of Frisian. The master programme Multilingualism is located in Ljouwert (in Dutch: Leeuwarden) – the capital of the multilingual province of Fryslân. How did this affect your learning experience? Being in Ljouwert has offered me the chance of experiencing a minority context from within. I myself come from another minority (Catalan), and it has been very interesting to see the parallels and the differences from within the community. You can study this at home, but you would never get the insights you get when you are here and try to participate in the community. I think this has enriched my experience in the master’s, as has the opportunity to learn the Frisian language. What was your biggest eye-opener about multilingualism – and in particular the Frisian language – in the Netherlands? The Netherlands prides itself in being a multilingual country, and particularly Fryslân repeatedly announces its multilingualism. However, it is quite shocking from an outsider’s perspective how little Frisian is seen in the public sphere. On coming to Ljouwert as a visitor, you may think the province in bilingual in Dutch and English, rather than Dutch and Frisian. I think multilingualism in the Netherlands is a very noble goal, but it has not been really achieved. Instead, there is a clear diglossic situation where Dutch (or English) are used everywhere and Frisian (and any other language) is just used at home and/or with close friends. This, in my view, is not multilingualism, this is just a society made up by mainly bi- or trilingual people. You said you’re from Catalonia, can you tell us something about the resemblances and differences between Catalonia and Fryslân? Both Catalan and Frisian are constantly under pressure of a much bigger language, and in many aspects they are really similar. However, two key differences stand out for me. Catalan is the mother tongue of only around 33% of the population of Catalonia, whereas Frisian is spoken natively by a over half the population of Fryslân. And yet, the status and presence of Catalan in every level is much stronger than that of Frisian. In my opinion, the ‘success’ story of Catalan is linked to the educational system, and I would argue that is the ‘lack of success’ of Frisian. As long as Frisian is kept out of the classrooms (or taught only an hour a week as a subject), Fryslân will not embrace its multilingual nature. In that respect, I think it is essential that Universities offer the opportunity to study Frisian. A language needs to be cultivated at all levels, especially an official language that is supposed to be used for formal purposes. One needs people to study the language to ensure the quality of translations, customer care and teaching. If Frisian disappears from the University, how are we going to form the teachers needed for a real bilingual educational system? What has studying Multilingualism at the University of Groningen brought you? I would definitely recommend both the BA and the MA to other students interested in minorities. It is a refreshing change to experience what in other programmes you would just be told about in class. If you want to study minorities, Ljouwert offers the perfect setting. Here you can see the complexity of (socio)linguistic studies at play, with constant negotiation of Frisian and English with the dominant language, Dutch. Being able to immerse yourself in the situation will definitely help you understand it and also acquire a different perspective, not just that of the scholars, but also that of the minority speakers themselves. What are your plans after finishing the master Multilingualism? After I finish this master’s, I still do not know what I will be doing next year. I want to further my studies and pursue a PhD in Linguistics, but I would like to do that in the US and I will have to wait to apply for a position. I want to do research and document endangered and minority languages, and I would also like to collaborate with different language revitalization processes. I am actually trying to find something in Fryslân for next year, which would allow me to keep learning Frisian and, hopefully, help as much as possible with language promotion in the province. Do you have a message for people who are part of a minority or speak a minority language?? Speak your language. Speak it everywhere. Use it everywhere. With everyone. Speak it with your family and friends, but also with strangers. Speak it on the phone. Speak it in shops, in the town council. Use it on WhatsApp. Use it on Facebook, on Twitter, on Instagram. Keep it alive. It is your language, and no one can ever prevent you from using it.